The NCST’s writing committees are seeking subject matter experts and public comment as they prepare for the 2020 Congress. 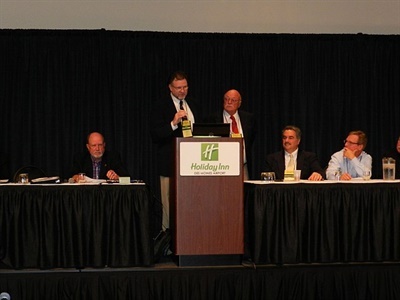 Murrell Martin (shown left) and Bill Loshbough are shown here leading a discussion at NCST 2015. MONTPELIER, Vt. — The National Congress on School Transportation’s (NCST’s) writing committees are seeking subject matter experts and public comment as they prepare for the 2020 Congress. The Congress’ committees are responsible for researching suggested changes to the National School Transportation Specifications and Procedures (NSTSP). The committees tasked with working on the publication, including the Emerging Technologies Writing Committee, are now active, and are accepting new subject matter experts, according to a news release from the National Association of State Directors of Pupil Transportation Services (NASDPTS). Anyone who is not currently serving on an NCST writing committee and believes they may be qualified to serve as a subject matter expert can contact the appropriate chairperson listed on the 2020 NCST change request form, which can be found here. The committees are also accepting change requests from any interested party. Change requests can be made on the change request form as well through the March 31, 2019 deadline. The NCST Steering Committee recently met in Kansas City, Missouri, during the NASDPTS Conference. That committee includes representatives from four sponsoring organizations: NASDPTS (including the School Bus Manufacturers Technical Council), the National Association for Pupil Transportation, the National School Transportation Association, and the National Safety Council. Since 1939, the NCST Congresses have been held periodically with the primary objective of ensuring safe, efficient transportation for schoolchildren. Since 1980, the more than 300 delegates from across the U.S. who make up the NCST have convened every five years. The 17th Congress will be held in Des Moines, Iowa, from May 17 to 20, 2020. Contact Steering Committee Chair Patrick McManamon at [email protected] with any questions.